The National Preservation Conference landed in Austin, Texas, last week under the banner “Next American City, Next American Landscape.” Exploring preservation’s role in the future of the country’s urban, suburban, and rural landscapes, the 2010 conference showed that preservationists aren’t all stuck in the past. (In fact, they’re pretty savvy when it comes to new media. Check out the NTHP’s Austin Unscripted on their website, Twitter, and YouTube to see how preservation can appeal to a new generation.) 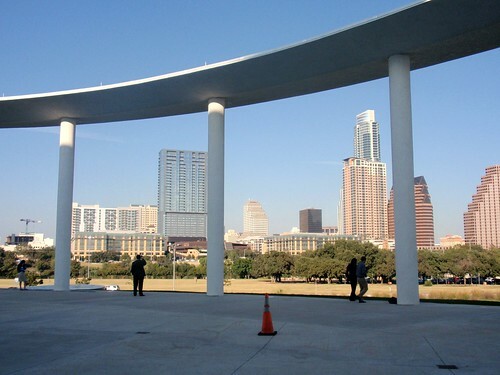 The opening plenary was held at the Long Center for the Performing Arts, which is sited to take advantage of the unobstructed views of downtown Austin. 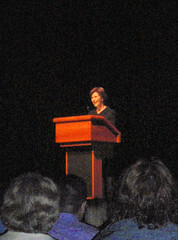 Laura Bush speaking at the National Preservation Conference. After a warm welcome from Austin Mayor Lee Leffingwell and a performance by local musicians Phoebe Hunt, Seth Walker, Susan Torres, and Ryan Harkrider (check out the rehearsal video here – skip to 7:25 for a sample of some of Austin’s famous live music), the packed house of preservationists heard remarks from the new NTHP President Stephanie Meeks, former First Lady Laura Bush, and New Yorker architecture critic Paul Goldberger. Some attendees seemed surprised by the choice of Mrs. Bush, but she’s been involved in preservation for some time. On Tuesday evening, she spoke about her passion for the preservation of the historic courthouses of Texas, including the one where she and former President Bush got their marriage license many years ago in Midland. 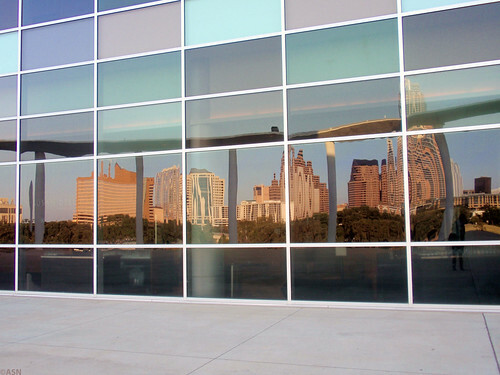 Downtown reflected in Long Center. Goldberger also pointed out that “poverty is a great friend” of historic preservation, simply because there’s less money and therefore less of an impetus for building big and tossing aside historic buildings because they aren’t shiny and new. In light of that, he felt that Austin was yet again a good role model for the Next American City, since it has prosperity but also pays heed to its architectural past: Its “solid economy has not led to a complete indifference to preservation.” Hopefully, as the city goes forward with developing a denser downtown, especially in the residential sector, the powers that be will remember that historic buildings or streetscapes are of significant value to the community.